2 CORINTHIANS 2:14 KJV "Now thanks [be] unto God, which always causeth us to triumph in Christ, and maketh manifest the savour..."
11Lest Satan should get an advantage of us: for we are not ignorant of his devices. 12Furthermore, when I came to Troas to preach Christ's gospel, and a door was opened unto me of the Lord, 13I had no rest in my spirit, because I found not Titus my brother: but taking my leave of them, I went from thence into Macedonia. 14Now thanks be unto God, which always causeth us to triumph in Christ, and maketh manifest the savour of his knowledge by us in every place. 15For we are unto God a sweet savour of Christ, in them that are saved, and in them that perish: 16To the one we are the savour of death unto death; and to the other the savour of life unto life. And who is sufficient for these things? 17For we are not as many, which corrupt the word of God: but as of sincerity, but as of God, in the sight of God speak we in Christ. Now thankes bee vnto God, which alwayes causeth vs to triumph in Christ, and maketh manifest the sauour of his knowledge by vs in euery place. But praise be to God who makes us strong to overcome in Christ, and makes clear through us in every place the value of the knowledge of him. But thanks [be] to God, who always leads us in triumph in the Christ, and makes manifest the odour of his knowledge through us in every place. Now thanks be to God, who always causeth us to triumph in Christ, and maketh manifest the savor of his knowledge by us in every place. But to God be the thanks who in Christ ever heads our triumphal procession, and by our hands waves in every place that sweet incense, the knowledge of Him. 2:14 To triumph, implies not only victory, but an open manifestation of it. And as in triumphal processions, especially in the east, incense and perfumes were burned near the conqueror, the apostle beautifully alludes to this circumstance in the following verse: as likewise to the different effects which strong perfumes have upon different persons; some of whom they revive, while they throw others into the most violent disorders. 2Co 2:14 Now thanks [be] to God. He did meet him there, and heard news that filled him with thankfulness. To triumph in Christ. A Roman triumph was given because of victory; God always gave the victory, through Christ, in the end. He had feared that Corinth would be an exception. Maketh manifest the savour of his knowledge. The figure is that of a sacrifice. A sweet-smelling savor was diffused by the offerings. So, through them everywhere, the knowledge of God was made known, and was grateful to the saved. He that is saved in Christ is empowered by the grace of God upon the saints to be triumphant in every situation and the joy of God is to display his wisdom through our weakness. I am grateful to my Father, whom through His son, our Lord and Savior, Jesus Christ, my faith is strengthened with every test, trial, and tribulation. I acknowledge, proclaim, and declare it is through Christ that I am triumphant that I am victorious. No fight or battle is won without Him. Glory to God! 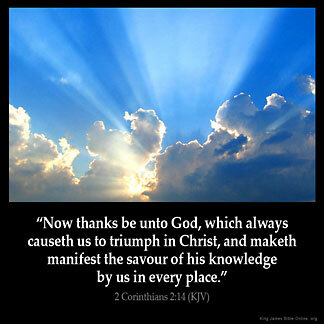 God maketh manifest His knowledge by us when we triumph in Christ. His savour is sweet to some and bitter to others. but to us who are saved it is a triumphant salvation Triumph means we display the excellency of His Glory . We are a testimony !!! We are conqueros !!! God is respecting the covenant he had with Christ through us, by making us come out successful from every test and trial we face because of him, thereby displaying the reality, authenticity and beauty of his status as King of Kings and Lord of all in every place.